View topic - bmp2sms - Forums - SMS Power! 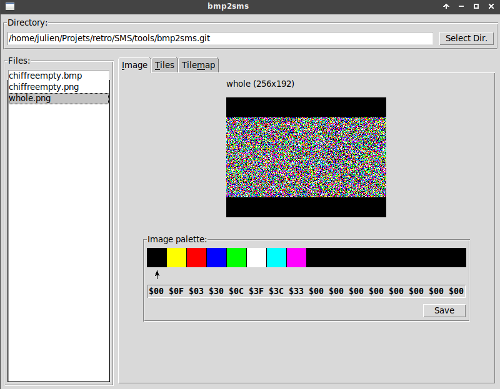 bmp2sms is yet another clone of bmp2tile with portability in mind, it is made with Tcl/Tk and should support a quite large number of platforms, it is UI centric for now (no commandline support). It was in a frozen state since 4 years but the development was resumed some days ago as i am fiddling again on the platform and i completed some of the missing vital features. 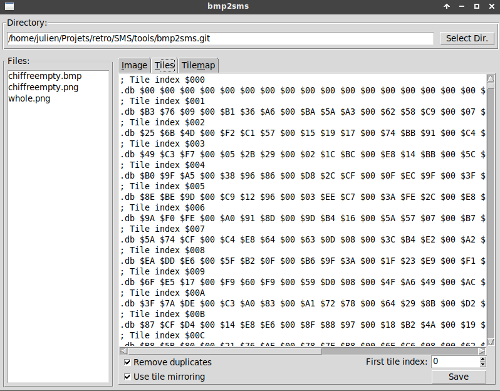 It support compression plugins made for bmp2tile via Ffidl Tcl package which is not so easy to install on some systems unfortunately, i may write something about it. 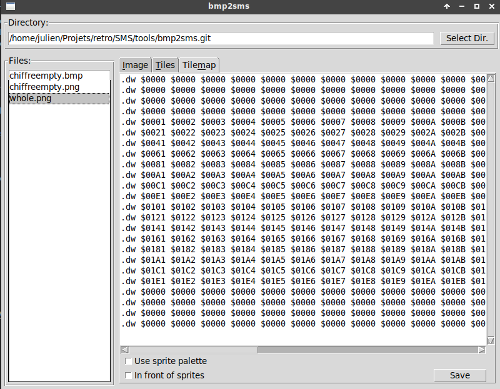 The UI is almost like bmp2tile except that it load a complete directory instead of one file and it has a bundled palette editor with palette picker, the palette can be reordered and colors can be changed.